Donald Valu is the Chief Executive Officer of the Konebada Petroleum Park Authority [KPPA]. The KPPA is a state owned statutory authority formed to promote the downstream processing of petroleum products in Papua New Guinea. The KPPA is already under investigation for an alleged land grab, described as a ‘scam’ by the National Research Institute, and PNGi has previously revealed a series of questionable corporate investments, other shady dealings and extravagant expenditure. A Public Accounts Committee report published in 2010, also alleged widespread financial mismanagement and abuse of public monies. To this list, PNGi can now add the evidence to support a series of serious fraud allegations against the CEO. Whether any of these allegations are true is, of course, a question for the police, Ombudsman Commission and Internal Revenue Commission to investigate and, ultimately, for the courts to decide; all we can do is lay out the evidence that has been uncovered and let others make their judgement. 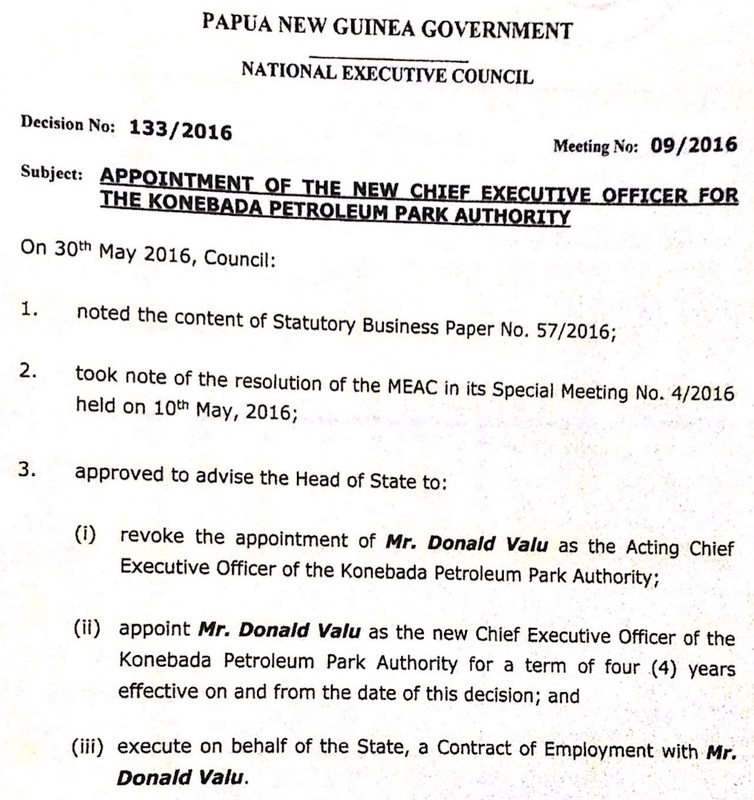 Donald Valu has been CEO of the Konebada Petroleum Park Authority (KPPA) since January 2012 when he was promoted from ‘KPP working group project manager’ to acting CEO by the National Executive Council [NEC]. Valu was then endorsed to continue in that role by the NEC in August 2015. Just nine months later, in May 2016, the NEC decided to revoke Valu’s ‘acting’ status and award him a four year, fixed-term contract. NEC made the decision based on the advice of the Ministerial Executive Appointments Committee. The NEC decision was published in the National Gazette on 14 June 2016. However, the awarding of a four-year contract, on a generous K370,000 a year package, appears not to have been sufficient to satisfy Donald Valu. It is alleged that he decided that as well as his new contract, assuring him of four years further employment as CEO, he should be paid ‘compensation’ for the termination of his ‘acting’ position. Yup, that is right, Donald Valu appears to have celebrated his new contract by submitting, by letter, a claim for compensation for the revocation of his old contract. 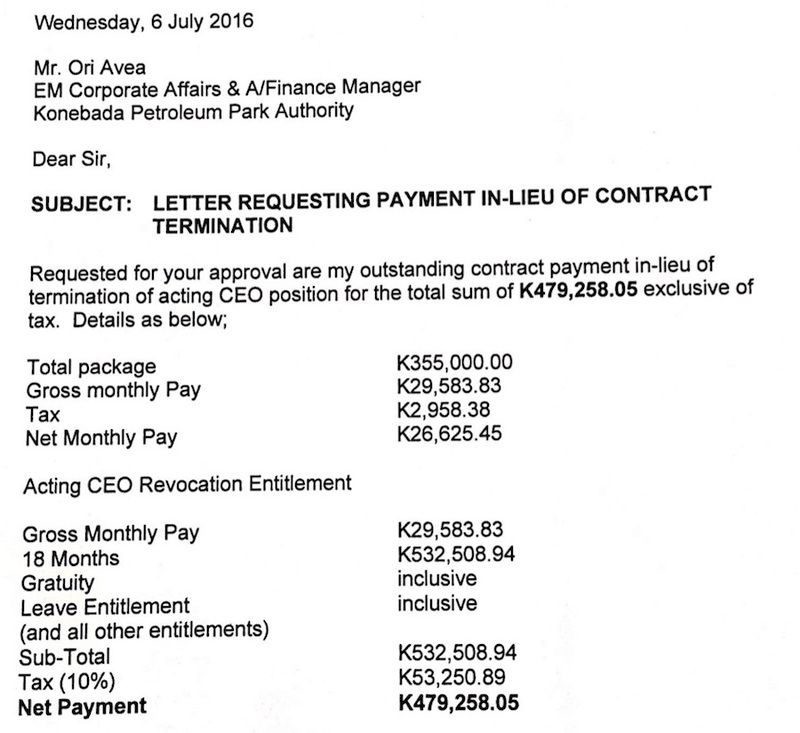 And not just any old compensation, Donald Valu appears to have claimed, as ‘payment in lieu of contract termination’, the sum of K479,258.05. This was calculated, according to his letter, on the basis of 18 months gross salary less 10% tax. Not only did Valu submit his claim for 18 months pay as compensation, documents appear to show that the claim was duly paid. A cheque, number 4373 was allegedly issued by the KPPA on 7 July 2016, in the sum of K479,258.54, and processed by the ANZ bank on 11 July. A letter from the Department of Personal Management, dated 14 June 2016, congratulating Mr Valu on his new contract made no mention of any compensation or other ‘payment in lieu’. There is also no evidence sighted that Valu’s claim was ever approved by the Minister or even the Board of the KPPA. From a legal standpoint, even if such approval was given, it would not necessarily provide a defence to a criminal charge of misappropriation or fraud. The whole alleged ‘scam’ has a remarkable similarity to one allegedly executed by Isaac Lupari who tried, in 2003, to claim compensation for each time he had been moved to a new government role. He claimed some K3.7 million in compensation, according to the findings of the Commission of Inquiry into the Department of Finance. The Commission recommended Lupari be investigated by the police for fraud and conspiracy. Not only did Donald Valu claim and get paid what many might regard as an outrageous ‘termination payment’ in July of 2016. There is evidence of other unexplained payments earlier in the year that deserve investigation. Financial records from the KPPA allegedly reveal a series of five payments totalling K344,249.95 were made to Donald Valu between Jan and June 2016. These payments, documents appear to show, were variously described in the records as ‘Entitlement’, Progress Payment [on] Entitlements’, ’Progressive Payment on Entitlements’ and, ‘Final Entitlement Payout’. What were these entitlements and were they approved by the Minister, the Department of Personal Management and the Board of the KPPA? There are also some serious questions that can be asked about Mr Valu’s tax affairs. Firstly, as we have already seen, in relation to his claim for ‘payment in lieu of contract termination’ in the sum of K479,258, tax was deducted in the calculation at the rate of 10%. Personal income tax rates in PNG vary from 22% on income over K10,000 to 42% on income over K250,000. This suggests Mr Valu may have substantially underpaid the tax due on his payout, whether he in fact did is a matter for the authorities to determine. 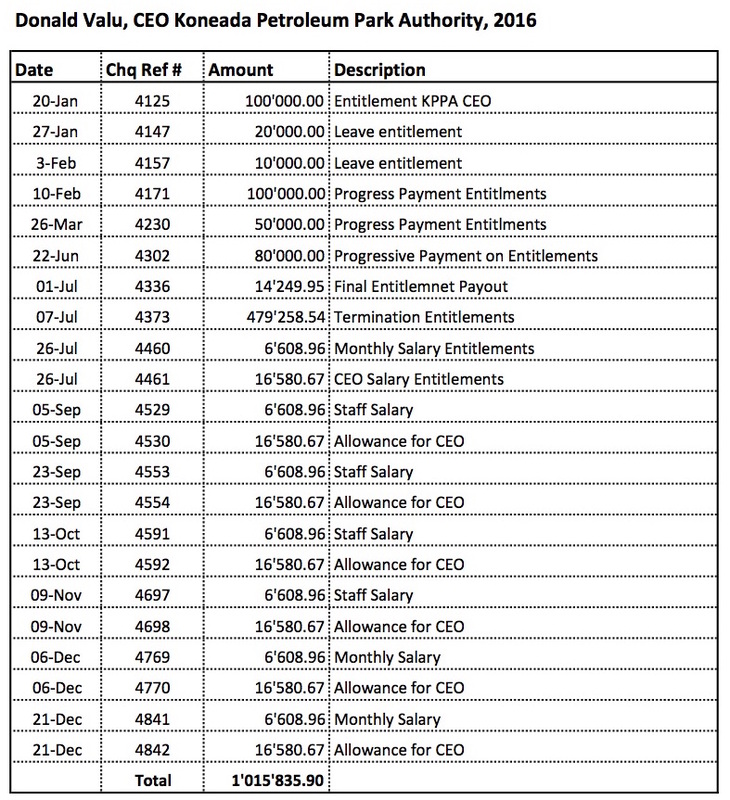 PNGi has also sighted evidence that Mr. Valu’s monthly allowances, which total K198,968.04 per year, are not being paid to him directly but are paid out, with no tax deducted, to a company, Perilla Investments Limited. PNGi has previously written about a similar scheme used by the Managing Director of the Mineral Resource Development Company, to try and avoid tax. In that case the company being paid the allowances was wholly owned by the MD. The scheme was described as ‘tax evasion’ by the Auditor General who ordered it be stopped. 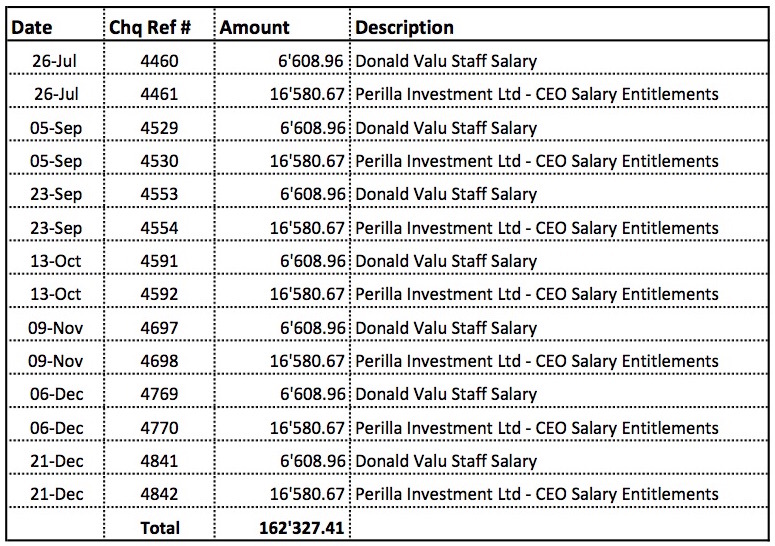 Mr Valu’s decision to have K16,580.67 from his salary paid every month to Perilla Investments, may, on its face seem rather strange. Perilla Investments is a company registered in 2010 with two shareholders, Onea Evele and Aruai Geno, who are also the only directors. The company has never filed an Annual Return. However, PNGi has uncovered another company, Sons Limited, also registered in 2010, that shares the same residential [Section 317, Allotment 14, Gerehu] and postal [P.O. Box 204, Gerehu] address as Perilla and has as its sole shareholder and a director a Kalei Geno VALU. This strongly indicates some family connection between Perilla and Donald Valu. During 2016, Donald Valu allegedly made three overseas trips in his role as acting CEO of the KPPA, to the Philippines, Taipei and Hong Kong. In total, it appears from documents shown to PNGi, Valu was paid K230,557 in travel allowances for those three trips, and a further K50,000 for a trip to Manilla in February 2017. We don’t know how long each of Mr Valu’s trips lasted, but if we take a guess at two-weeks for each, 56 days in total, Mr Valu’s allowances would work out at K5,010 per day. Even if he were away for a month at a time, his allowances would work out at over K2,500 per day. In two instances payments made to Valu were, allegedly,exactly K50,000; which could be argued to look suspicious. How were Mr Valu’s allowances calculated, were they inline with government protocols and how were they approved? In March 2015 it is alleged that Donald Valu was reimbursed K110,491.64 by the KPPA for ‘Medical expense in Manila’. Under the terms of Mr Valu’s current employment contract he receives both a K6,000 a year allowance for ‘Life and Medical Insurance’ and is enrolled in a Medical Benefits Scheme by the Department of Personnel Management. Whether or not Mr Valu was enjoying these benefits at the time he allegedly sought medical treatment in the Philippines, there are valid questions to be asked about whether Mr Valu was entitled to claim and be reimbursed for overseas medical expenses and who approved such a large payout, the KPPA Board, the DPM, the Minister, or NEC? Further, as the reimbursements paid to Mr Valu were clearly a benefit derived from his employment, should tax have been paid to the IRC? In total the payments made to Mr Valu by the KPPA in 2016 totalled almost K1.3 million. This represents over 20% of the total government appropriation allocated for the KPPA in 2016, which was K6.447 million. 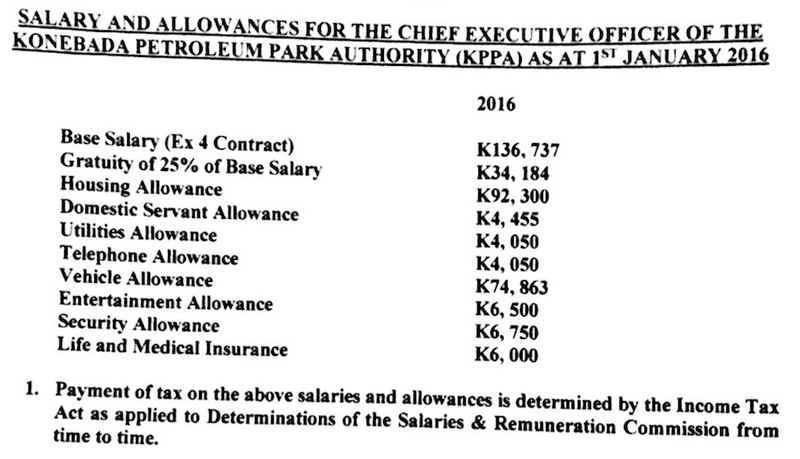 According to government budget estimates, the KPPA appropriation included just K150,000 for travel – a figure exceeded by almost 100% by Mr Valu’s travel allowances alone. There was also just K95,000 allocated for retirement benefits, pensions and gratuities. The KPPA is, under its trust instrument, supposed to be processing all financial transactions through the Papua New Guinea Accounting System [PGAS]. However, despite spending more than K80,000 to purchase the software and necessary hardware in 2012, it is alleged the KPPA has never implemented the system. Instead, according to sources, it operates a manual accounting system, with all payments authorised by the CEO, Donald Valu, and Executive Manager for Corporate Affairs, Ori Avea. In 2010 the Public Accounts Committee argued that the KPPA, when it was constituted as a limited liability company, was being abuse by senior corporate officials to pay for lavish lifestyles. In response, the KPPA was put on a statutory footing. The evidence presented in this report raises serious doubts over whether this has prompted any significant change in the managerial and financial management culture at KPPA. It is now incumbent on the government to take swift action, ensuring steps are taken to protect KPPA assets, and a criminal investigation is launched into serious allegations of misappropriation.